My Hanukkah memories are filled with oily foods, chocolate coins, a menorah with flimsy candles that were always breaking when we tried to jam them into their waxy holders, and—most of all—a commitment to finding a little time each of the eight nights to circle in the living room and sing “Happy Hanukkah” to the tune of “Happy Birthday” (the invention of parents who were self-proclaimed nonsingers). Even though there is no jolly mascot, no claymation television special, and no shrub to adorn, there are beautiful and creative ways to make Hanukkah traditions rival flying reindeer. As a Solo Mom, I am devoted to celebrating Hanukkah each night. Here are eight tips for a special Hanukkah, no matter what size your celebration. PJ Library is a free service that provides Jewish books to children and families once a month. If you sign up your child for this service, you can save eight free books throughout the year to put in your Hanukkah book bag. Dolly Parton’s Imagination Library is not available everywhere, but it’s worth a try to see if it is in your area. 2. Create your own decorations. My son gets excited when we light the candles on the menorah he made or when we draw the flame on the menorah he drew. He’s not always up for a craft, so a simple menorah project would be taking nine balls of clay (Play-Doh could work, too) and decorating them with beads, glitter, macaroni, shells, or whatever you want. Stick Hanukkah candles in them, and there you have it. Don’t forget to use nine balls of clay—one for each of the eight nights and another for the Shamash (the candle used to light the other eight candles). For the more dedicated artist, Pinterest is full of Hanukkah craft ideas. 3. Make latkes. My mother made delicious latkes, but it always seemed to be such a big production: Cuisinart whirring, three frying pans of oil sizzling, rolls of paper towels for blotting, and potato peels flying. I felt intimidated to make latkes for two; latkes for two is pushing it, as my son eats enough to power a rabbit for a week, so it’s more like latkes for me plus one extra potato pancake. Let me assure you, latkes freeze well. Also, the latke batter will keep in the fridge for a few days. I like to throw in some sweet potato for extra nutrition. And if you really don’t want to deal with the mess, Trader Joe’s makes great, inexpensive frozen latkes. 4. Sing songs. Yes, we sing songs every night. We say the prayer and light the candles and then, I require one more song. So much of Judaism is about the beautiful music, but “Oh Hanukkah, Oh Hanukkah” and “Dreidel, Dreidel” will do. To me, songs are just part of it . . . no gifts until someone sings a song. 5. Play the dreidel game. How can the dreidel game be fun with only two people? When you provide prizes! My mom always had a prize box from which each family member could buy a prize with his or her pennies. My mom took time buying specialized prizes for each person: a small pack of Pokémon cards, a lottery ticket, a Hello Kitty trinket, or a scented lip balm. Use chocolate gelt for extra excitement. I keep a chart of the dreidel symbols handy and in case you have forgotten them yourself. 6. Tell the story. At least one night per Hanukkah, we tell the origin story. This wasn’t something I did growing up, but it’s something my son loves now. 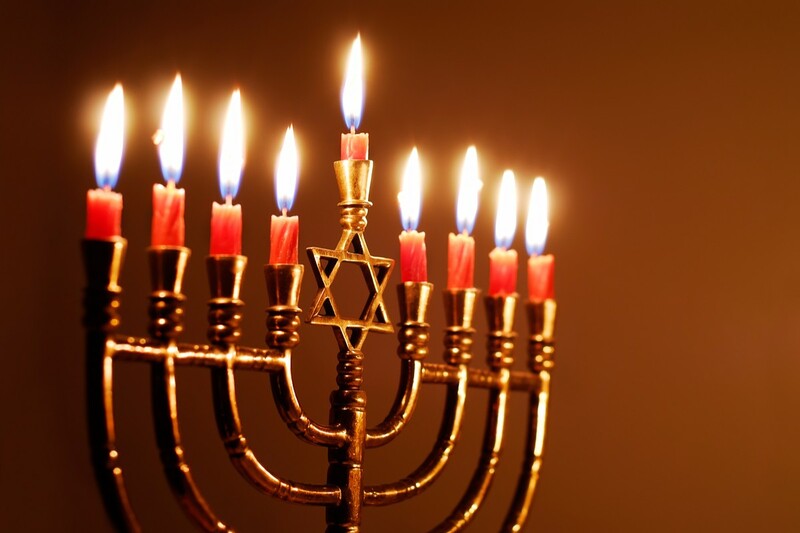 Why do we celebrate for eight nights? Why do we light candles? Why do we eat foods cooked in oil? If you don’t know the answers, Google will tell you. 7. Light candles all eight nights. Doing anything for eight nights in a row is a big commitment. But it’s that follow-through that makes it special. Schedules get busy and work happens, but making it happen means something to them. It meant something to me. I remember the juggling of schedules to find 10 minutes to light candles, sing a song, and get a gift. We weren’t religious, and yet Hanukkah meant a lot to me because we were invested as a family. Turn the lights down, and look at your child in the candlelight. 8. Celebrate your family. There is beauty in a Solo Mom family holiday. Jump in with pride. All families are different. We pass on the traditions that work, and we make new ones.